We all know and love the great onboard laps of Monaco. Jarno Trulli’s pole in 2004, Michael Schumacher’s ‘phantom’ pole in 2012, and pretty much anything Ayrton Senna did around the streets. But as brilliant as they are to watch, the onboards from slower, trickier to drive cars can actually be just as dramatic as drivers wrestle with a lack of downforce and grip. Watching onboards from Minardis in the team’s later years was always something you tended to do whilst hiding behind a cushion as the cars looked so tricky to drive. This lap is no exception, as Zsolt Baumgartner hurls his PS04B around the streets with plenty of steering wheel movement. Baumgartner qualified in 19th - ahead of his teammate, but over six seconds off pole-sitter Jarno Trulli. By keeping it out of the barriers he managed to finish the race ninth and last, six laps down, and tantalisingly close to the points. The Super Aguri was basically a 2002 Arrows chassis rejigged for the 2006 rules, which goes a lot of the way to explaining why the car was so uncompetitive. Montagny (who replaced Yuji Ide four races into the season) did a solid job with the car, but could only qualify 20th and finished the race in 16th. The BAR 002 was by no means a terrible car, but for whatever reason, it just didn’t work at Monaco. Zonta was outqualified by everyone except the Minardis and was running 10th when he crashed out at Ste. Devote on lap 49. OK, so it’s not a full lap, but it’s more than enough to know that the last place you’d want to be is driving a car which doesn’t even look like it wants to go in a straight line! 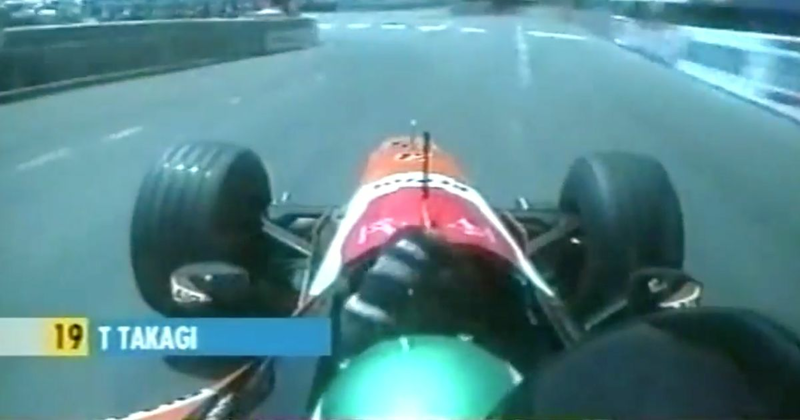 Serious skills from Takagi to miss Marc Gene’s crashed Minardi, too. He qualified 19th, a whole second ahead of teammate Pedro de la Rosa, though his engine failed during the race. The 2002 Sauber was a solid midfield performer but Monaco that year wasn’t the team’s best race. Quick Nick only qualified 17th - and with traffic like this during the session (check out the cheeky middle finger on the way into Rascasse! ), perhaps that’s not surprising. Maldonado must have thought he was on for big things when he signed for Lotus following two years of regular podiums and wins for the team, but the E22, with its unusual forked nose, was awful. Despite generally being pretty good at Monaco, Pastor only just scraped through to Q2 and would have started 15th had the car not broken down on the grid. Take a ride with the late Jules Bianchi around the Principality in his debut season, 2013. Although Marussia spent the year fighting at the back with the Caterhams, it’s amazing to see the difference in how easy it looks to drive this compared to the backmarkers of 10 or 15 years beforehand. Unfortunately, Bianchi didn’t get a chance to qualify because of an engine failure - a real pity given that Q1 that year was wet and he would surely have had a good chance of making it through. Now there’s a camera angle you don’t see every day! Tyrrell was right up against it in 1997 (hence those radical X-wings) and Monaco provided a rare opportunity for a result. Salo delivered, qualifying 14th (teammate Jos Verstappen was last, a massive 1.6 seconds slower) and managed to complete the whole race without pitting to finish fifth - the team’s final points finish in F1. The Arrows A22 was an alright car - but only on fast tracks, and Monaco is not a fast track. Here’s Jos the Boss hustling his car on his first qualifying run. He eventually ended up 19th of 22 cars - ahead of Luciano Burti’s Prost, but behind Fernando Alonso in the Minardi - and went on to finish eighth.